In the end of January the Lexicum team had a stand at BETT 2014 - an ed tech trade show attended by more than 30,000. There we conducted a marketing survey that was intended to exploratory, rather than representative. We collected data from 47 language learners and 53 representatives of organisations involved in language teaching. While the majority of respondents were from the UK, there were also representatives from 13 other European countries and several representing countries from other continents. Typically, representatives came from organisations that employed more than 100 people. Here we present results from our study and our conclusions from these. We'd like to also use this post to announce the winner of contest who gets the £50 Amazon voucher. Our sample provided us with interesting insights into current trends among language learners. From our respondents 73% have learned a foreign language at school, 32% - with self-paced training and 14% at a language center or with a private tutor. The total is more than 100% as some respondents have combined different methods. Native English speakers were more likely to engage in self-paced learning. 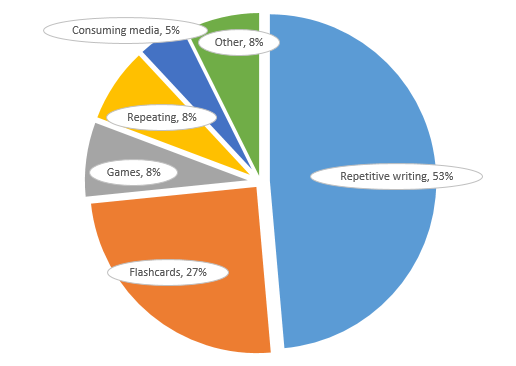 53% for repetitive writing - this was a surprise finding but more on this in the discussion. As we expected, learners typically had used traditional paper-based materials, but were open to explore new digital tools. The ones that had actually used digital tools mentioned that they've had positive experiences with Duolingo, Quizlet and Memrise as tools to guide them through the entire process. A few tools that are responsible for a tiny part of language learning were mentioned, notably Linguee. From the respondents that had gone through private tuition no one mentioned using online tuition like Learned By Me, just traditional - something we're quite sure is bound to change soon. In terms of time preference, a tendency towards morning or evening was evident, based on personal habits. However, these preferences were overshadowed by the respondents professional life and they commonly reported to find time to learn in between responsibilities, be it while commuting or while waiting for any other reason. By far the highest interest was for French, followed by English (as a second language) and German. Second tier were Spanish, Russian and Japanese. There was a dozen of other languages that attracted individual interest. More than half of our respondents used Apple mobile devices. These were mostly iPhones, but also iPads for those (fewer) who reported using tablets. About a third were Android users, and occasional users of other platforms, where only Windows platforms stood as a distinctive class. The representatives that filled our survey represented 29 schools and some other organisations. We had respondents from universities, language centres, educational authorities and publishers. The languages represented corresponded loosely to the offering that our individual respondents provided. Again, French was first, followed by English, Spanish and German, in that order. The schools and language centres that were represented in our survey provided courses in close to 40 further languages, reflecting the long tail of demanded languages that we also identified with our learner respondents. The prevalence of repetitive writing was a surprising finding. This method is not a particularly useful investment of the learners’ time as it takes considerable effort and is inefficient in terms of retention as all the repetition takes place over a short period of time. Retention is greatly improved if repetitions are distributed across progressively increasing intervals a.k.a. spaced repetition. The exceptionally high interest for French is explainable with its popularity in the UK. An apparent trend is also the rise of German, and despite weak indications, that of languages like Chinese, Russian, Turkish, Arabic and Malay. Both on tablets and phones, in education Apple products continue to be the most popular ones. Yet, Android devices are also widespread, reflecting their increased general popularity. The learning habits clearly show that people would readily utilise commuting and idle time if they had the necessary tools, such as Lexicum. However, none of our respondents declared that they feel that they currently have such exercising tools that meet their needs. Whereas there’s less interest in foreign languages by Brits, Continental Europe and the US are huge markets with a lot of activity and investment. Developing markets also host a booming ecosystem of language learning organisations. Apart from courses being offered and the variety of publishers and suppliers operating in the space, there is also strong support by governments, NGOs and international organizations - representatives of such such organizations from 4 continents were featured in our small survey. Congratulations to Polly, who's taking home the grand prize! To all the rest of you - thanks for participating and let's stay in touch: facebook: facebook.com/lexicum twitter: @lexicum_net And just in case you haven't signed up for the lexicum waiting list yet - do it today and you'll get to try a better way to learn vocbulary before anyone else. Good luck with your learning, y'all! I honestly would not have thought people would put the effort into repetitive writing. Perhaps I assume people are lazier than they actually are. Maybe it gives a sense of achieving something while not actually accomplishing much (busy work). By now I am starting to believe that certain people are very dedicated to learn a language, but cannot find the tools to make the process more efficient. Actually it is not necessarily about tools, much rather techniques (tools could possibly support some of them). One of the most prominent stories we get is how students prepare for exams. They seem to just stare at their wordbooks, not even realising that if they cover half of the page they could start testing themselves for different words.